The remarkable thing about Shirley Ann(e) Field is that she has survived and become more interesting with the years. 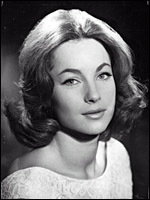 A Cockney child, born on 27 June 1938, she became a 'beauty queen' and landed tiny parts in several films, including Simon and Laura (d. Muriel Box, 1955) and Lost (d. Guy Green, 1955), without making much impression beyond that of exceptionally pretty ingenue. She made a merit of vapidity in Peeping Tom (d. Michael Powell, 1960) and was rewarded with the roles of Doreen who finally snares Albert Finney for domesticity in Saturday Night and Sunday Morning (d. Karel Reisz, 1960) and Tina who seduces Laurence Olivier in The Entertainer (d. Tony Richardson, 1960). She did what she could with what the 1960s offered: sister to thuggish Oliver Reed in The Damned (d. Joseph Losey, 1961) and one of Alfie 's (d. Lewis Gilbert, 1966) girls. She was out of films for a decade, then back with new confidence as Saeed Jaffrey 's warm-hearted mistress in My Beautiful Laundrette (d. Stephen Frears, 1985) and there were glowing character studies in Hear My Song (d. Peter Chelsom, 1991) and TV's Lady Chatterley's Lover (BBC, 1992), and, on stage, as shady lady Lottie Grady, in When We Are Married (1996). Autobiography, A Time for Love, 1991.